Gov. 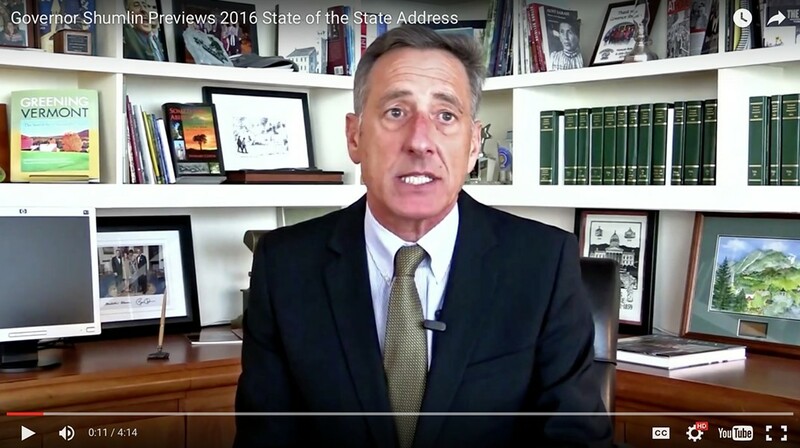 Peter Shumlin previews Thursday's State of the State address. Republican presidential candidate Donald Trump's visit to Burlington Thursday is sure to overshadow Gov. Peter Shumlin's final State of the State address, which will take place just hours earlier. But the gov's office appears intent on keeping the focus on Shumlin's valedictory. Last week, it launched a new website dedicated to his State of the State speeches, past and present. The site features short clips from the archives, highlighting the proposals that actually passed and not-so-curiously omitting those that sputtered out. On Wednesday, Shumlin's office released a four-minute "sneak preview" of this year's version, filmed in the governor's corner office on the fifth floor of the Pavilion State Office Building. To call it a preview, though, might be a bit of a stretch. Shumlin, eyes awkwardly affixed to a script or a teleprompter above and to the right of the camera, spends much of the video rattling off his proudest achievements since taking office five years ago. He does offer one kernel of intel: that he'll propose a "Step Up program" to help low-income Vermonters afford higher education. "We'll offer these hardworking Vermonters an entire semester of free courses and, most importantly, the support services they need to help them balance the numerous competing challenges in their lives, so they can get back into school and on the road to a better future," Shumlin says. For more details, you'll have to tune in Thursday — unless you're busy watching Trump.